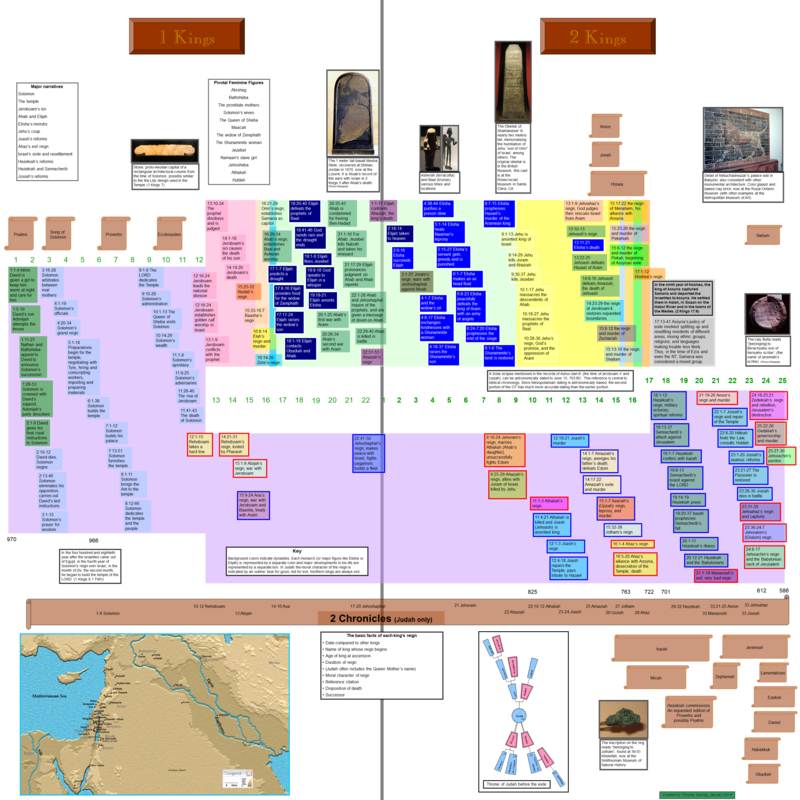 Pastor Tim created this chart for his class on First and Second Kings. There is a link below to download the file in order to read the text. Some things make me emotional. What I generically call home-sickness is one of them. This happens every time I leave family behind and lasts for about three days. It happens when I'm tired. Sometimes it's less predictable: a random thought about a dead loved one or even a pet; a flash realization of the beauty and helplessness of children. Today I have been emotional. The news is a constant and recurring distraction. I have read enough about the shootings in the south and in the mid-west, and about the shootings in Texas to make me want to withdraw. I am finding that tears come easily today. It doesn't help that the atmospheres on Facebook and reddit are full of both pleas for peace and polarizing rhetoric. I would love to tell everyone to just be quiet. Nothing fuels a fight like exposure and ranting. Nothing is less conducive to healing. My distant family history has a deep root of racism that I consciously reject all the time. While I disagree with the violence mongers with whom I have contact, I understand their culture and sympathize with the limited perspective that allows a stronger than warranted opinion about these things. At the same time I internalize the sadness that goes with other people's grief. I find myself looking for good reasons for people to have suffered as they did. Of course, that's a futile search, because each situation was random in its own way and resulted in deaths unrelated to anything the people were actually doing - no immediate guilt, no immediate cause. I know my impulse to withdraw is a pipe dream. The violence of human beings is one of the most deeply rooted, historical manifestations of depravity. It goes back to two brothers and a jealous fit over theology. There is no real escape. I even wrestle with myself over these dilemmas. If the fight isn't social, it's internal. Obviously to withdraw is impractical and irresponsible. The level I think about this would probably astound some people. Today I took a break from the distraction of the news to be distracted by travel packages to Antarctica. Might as well just admit the unlikeliness of the impulse. But if I have anything to contribute to the discussion it is this. I will not respond to the rants of others, not even to encourage sanity. Such a response is pointless and ineffective. I will not indulge in judgement either on movements or professions. I will speak only of the pain in my own heart, and not attempt to interpret the pain of others. I will not contribute to the fray by stating an opinion about what somebody else did right or wrong. I will only grieve. Many times again Cain has struck, and many times again Abel has fallen. Many times again, Cain has attempted to justify himself, and many times again he has failed miserably. I love Victor Frankl's book Man's Search for Meaning. It is both the story of a doctor's heroic work to save the dignity of holocaust victims and his own therapeutic model developed largely from those experiences. It is a tour de force on attitude. In thinking about attitude as it relates to my dissertation I wanted to draw on Frankl's amazing work. I kept running across this quotation attributed to Man's Search for Meaning. In our response lies our growth and our happiness." This is a profound idea and is strongly supportive of the human power of choice. Now, here's the rub. This quote is often attributed to Viktor Frankl, and maybe he said it. It is also (in Goodreads among countless other sources) attributed specifically to Man's Search for Meaning. The statement is not in the book. I am now amused when I read blogs by people who thoughtfully speak of how much they love Man's Search for Meaning and quote this statement. If they really love the book they should know they didn't find the quote there. It is possible that it's in an earlier edition, but if it is, and it's so popular, why was it left out of later editions? "I did not note the name of the author, so I’ve never been able to give proper attribution. On a later trip to Hawaii I even went back to find the source and found the library building itself was no longer present" (p. vi). So, I'm left feeling a little like a Pevense, returning to the spare room to open the wardrobe to find not only Narnia and the coats, but, in fact, the wardrobe itself is gone. Who gave words to this profound idea? Is it Covey himself? Is the book in which he found it a figment of an over-saturated mind soaked in a stream of thought? If anybody knows who actually said this, I would love to find out. We are in our 25th year together and I am thankful. We have something special. It is special for its value and beauty to me, not for any particular feature of our relationship that nobody else can have. This scripture sentence says volumes about what can make a relationship, whether it's a marriage, a friendship, or any other family connection good. It's in the overlooks. Ask yourself this: "Can I be patient with the other's flaws?" If you can't chances are you are also not being wise according to Solomon. When I am being wise I am considering my own flaws. I am realizing that the other person in my life is not perfect just as I am not perfect. Chances are we have different imperfections from each other, but that does not make my imperfections any better or more acceptable than the other's. The fact that they are mine makes them look, to me, easier to live with. When I get short fused or demanding with the other, I am simply letting my own folly run away with me, and that too is a flaw. And now for the hard part. I may be patient when I am wise, but I am glorious if I overlook an offense. What about that other person offends my sensibilities, my sense of order, my feelings of being cared for, my image of goodness, my conception of intelligence? If I can just realize that I am no easier to live with than anyone else and that my own quirks are just as annoying, just as upsetting, just as niggling as anyone else's, I can reach a point of give and take, a place of forgiveness. There are places in conflict resolution for confrontation and compromise, but in our self-centered society we often bypass this first obvious step: to simply choose to overlook something that offends me. Make no mistake, it is a choice, one that must be exercised often, sometimes constantly. We are unique individuals and that means we are different from each other and those differences will feel out of place. It is in the nature of being different. It's like that mountain overlook. If I could get down into that mountain from my lofty height, I would see the litter left by campers, the droppings left by animals, the dangers, the impassible paths, the holes, rocks, and ruts, the rotting logs. 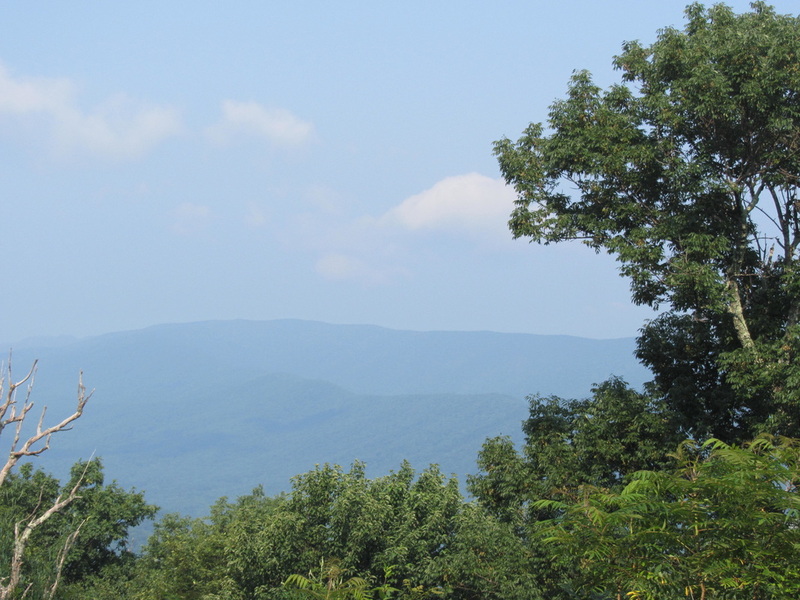 But if my view is to be glorious, from that ridge looking down into the valley, I choose to ignore those trouble spots and see the bigger picture, the majestic panorama of the whole rather than the distraction that the smaller parts can become. We are called by Solomon to allow our wisdom to shine like a glorious star, to be and, as a bonus, to appear to others to be a wonderful person of depth and beauty. We can be that person. It is in the level of personal stability we can find in living with the differences and the flaws of others. When my friend, spouse, sibling, parent, or adult child becomes an irritant, it's probably more my problem than it is theirs. Often others are just being who they are while I am expecting them to be someone else for my benefit. Of course some readers will be thinking, "I need to show this to someone else, so they can be wiser and more glorious in their patience and willingness to overlook something." Resist that defensive posture. Instead look at it for what you yourself can gain. Be the example in the relationship, the one who finds personal internal stability in accepting the other. Stand at the overlook and see the majesty of the bigger relational picture rather than allowing yourself to be sidetracked by smaller things. We are eternal beings in a temporary world. All of this is passing away as we speak. When we are weak, or old, or prone to problems these are manifestations of immediacy. Things of the spirit will last. That's where the glorious overlook can be found. As a pastor, I field calls at least a couple times a month asking for money from strangers. It's one of the harder things I do, because I almost always have to say no, then I spend a day or two feeling guilty about it while at the same time knowing I did the right thing. Trying to communicate with people in desperate need is hard, so I want to pass some wisdom along. A. Go to church. The most likely people to help in your time of crisis are people who know you, love you, and with whom you have a history. If you don't want anything to do with church, you should consider how hypocritical it is to ask for help from people you don't like enough to sit with for an hour. Also, remember that you are not the only person in need. There are people who do go to church who are also in need and they will get attention more immediately than you will. This is a logistical fact as well as a matter of responsible benevolence. When our resources are limited we are compelled to distribute them as wisely as we can. B. Start with proximity not "A". Going through the phone book is a good way to solicit rejections (think "telemarketer"). If you do not attend church and you need help, start with the churches closest to your house. You are more likely to get help from a neighbor than from a person whose location you cannot even pinpoint. Churches are part of their communities and want to be seen that way. They want to see their neighbors thrive and are much more likely to see you than strangers far away. Besides, they will always harbor hope that if you do decide to go to church, you'll go to a close one that had your back when you were in need. C. Don't call, come. In the first place, a personal visit exerts more pressure than a voice on the phone. If you really want help, this is a surer way of getting it. However, on a less cynical note, the phone is impersonal. A pastor cannot tell a thing about you over the phone, cannot respond to facial expressions, gestures, and body language, has no way of guessing whether you are lying or truthful. When a person has limited information upon which to make a financial decision, it is better to give them more information, not less. D. Don't ask for prayer if what you really want is money. A pastor will pray with everyone who asks and many who do not. Rest assured, if you ask for money, you will likely get a prayer too. I have fielded calls asking for prayer and when I prayed and did not read between the lines, the person on the other end of the phone became irate, as if I should be able to hear thoughts. E. Be prepared to invest in the process. Not money, of course, but you cannot expect a person to give to you if you want to maintain a high wall of privacy. Nobody wants to be up in your business, but this is not a bureaucracy that gives based upon statistics, these are caring people who give based upon relationships. You will be asked about your situation, your family, and your prospects for long-term recovery. You will likely be asked for a bill (like an electric bill) that can be paid so that money does not change hands and become subject to abuse. Even this is a concession, so don't be offended. Your benefactor has no way of knowing whether you are prone to abuse money, so he or she wants to be sure the gift does what it is meant to do. Remember, it's the church's money to use as they think best. That makes a few basic things the pastor's business. If you have other resources, you are likely to be turned down. An expensive or newish car in the driveway, an apparent cell phone, or a TV dish on the roof are means by which you may be helping yourself and are arguments against true need. Consequently, asking for help with your cell plan or cable bill is probably not a good move. F. Offer to attend services ... sincerely. These are folks who are getting you out of a jam. The least you can do is come around, if nothing else, to express gratitude. Here's the thing, the pastor will not betray your confidence. He will never tell the congregation that you are in dire straights or even that their money helped you. You need never reveal that. That's ok. Gratitude can be expressed to your own satisfaction without it ever being articulated. However, it might also be good to see what these nice people do, what they believe that makes them willing to help a stranger, what makes them generous and kind. You might have something besides money to gain by getting to know them and learning what they learn. G. Don't expect seconds. If you received a gift from a church one time you will not be given a second gift. This is not the church being self-serving, it is simple math. They will help as many people as they can and they will not help fewer people multiple times. Repeat gifts would be interpreted as irresponsible behavior on their part. However, repeat requests also make the pastor feel used and he or she will not volunteer to continue in that role. Even church members are seldom helped more than once, for two reasons. One, there isn't enough money to go around, and two, nobody is anxious to create a relationship of dependency or entitlement. H. None of this guarantees a response. If the church is small, as most are, they are likely struggling financially. They are not "refusing" to help you. They are unable to help you. There is a vast difference. When a person says, "Nobody will help me," it is a sure way of commuinicating to the person who is saying no, "You don't care," and that is probably not true. If you want to know what the Church's checking account balance looks like, look at your own. They are probably similar. The pastor feels bad about not being able to help. Rest assured, the pastor's heart is that nobody does without basic needs. Arguing your point, emphasizing your need, accusing him of calousness, or calling repeatedly will not change the fact that the stone has no blood in it. I. Remember that smaller requests will get a hearing faster than larger ones. If you call asking someone to pay your rent or fill your oil tank, a prospect that can quickly exceed $500 you are asking for a lot and nobody is small-hearted when they say no. If you can rearrange your finances though, asking family to help with a bill, and getting a church to buy your groceries, you may be able to creatively meet your need. A church will much more readily meet an affordable need, and food is among the most vital and understood needs. However, you should also be prepared to get what you get. The pastor might just drive around and get food donations from members and then deliver them to your house, so, once again, no money changes hands. That's the nature of being in need. J. Finally, know before you get into the situation that the pastor's resource is primarily spiritual, not financial. If the church is small, he or she is probably living on a sub-standard wage too. This is a person who likely knows what it feels like to come up short and survives on other things. Jesus said, "Man does not live on bread alone," and the pastor knows what that means. When they offer to pray for you, it is not an empty gesture. They are taking you to their own personal resource, and the fact that it is intangible does not mean it is not valuable. Take it from a pastor, everyone can use all the prayers they can get. Earlier in the year, Dawn received an email from Getty Music inviting worship leaders to apply to sing with them at their Carnegie Hall (CH) concert December 17. She sent for the information, and as most of our friends know it culminated in her dad Paul, our worship leader Terry, Dawn and I singing backup in the choir for Keith and Kristyn Getty. It was an experience not to be forgotten ... Why? Let me write this down so someday I will remember. First of all, nobody who takes seriously their art would willingly forego a chance to perform at one of the world's premier venues, and Carnegie Hall is arguably at the top of the list. navigating back stage halls and green rooms at CH you see posters from the scores of notable names who have occupied that stage, names from Fats Waller to Isaac Stern. More than many places I have been, The history of the place is palpable. I will not deny the thrill of this opportunity. Although our names were not on the poster (except as "and friends"), how can a person not feel highly honored to be in such rarefied air? Seeing our names listed with the choir in a CH Playbill was surreal. The pictures Dawn and I have facing upstage with the CH house in the background will be treasured for years to come. I know my own ability, and am painfully aware that many people I know are more qualified to occupy that space than I. My musical background is satisfyingly rich, but not grand. I can honestly say that this kind of event was never something I would have wished for, because it would not have occurred to me to do so. With all that in mind, it is easy to see how singing there could be both thrilling and humbling, because it was indeed humbling. The spirit of nearly everyone I encountered was as agreeable as you can imagine, from the other choir members, to the people serving coffee, to shaking the hand of Ricky Skaggs back stage. (Ask Dawn about her more extended conversation with him). The event was infused with a sense of deference and courtesy that belies all the cynicism even my disposition can harbor. The concert itself was like a plasma blast. There was so much energy and artistry on that stage that even Scrooge would have had to sway and bob. I had been a part of the concert before at Calvary Church, and it was still amazing. The story of the Christmas cease-fire, the gospel readings from Luke and John, the intimate tableaux of Keith and Kristyn playing and singing together, alone on the stage, the unabashed fun the fiddlers and the band members who danced, laughed, and communicated telepathically with each other across the stage all through the show. This high power performance came through even though we had been told that some of the members were sick with the flu. You could not tell. A few random memories I do not want to lose: Keith's wry sense of humor and wise insights into the place of music in the Christian life. Kristyn's lovely gold dress in the first half of the show and Keith's very cool vest. Her enchanting voice and speaking accent. The view of the harpist playing the high notes about 7 feet in front of my seat. The flashing lights on the bodrahn Shannon was playing for Sleigh ride and the flashing glasses the accordion player donned. The skillful playing of Ricky Skaggs who, once he was no longer considered a country star could have retired, but instead continued composing significant music. The children's skillfully executed counter-point on Jesus, Joy of the Highest Heaven. The dancers. Ben's patient and skillful leadership of the choir both during rehearsal and at the concert ... the realization that he was also leading a string sextet, wondering when he worked with them. Ashley warning us that anyone caught recording the concert in any way ... on a phone or whatever, would incur a fine for the Gettys from Carnegie Hall ... strict hall policy. Sharing the experience with Dawn, Paul, and Terry. My incredible gratitude to Dawn for getting me in shape for the concert, helping me with the thousand notes I would never have gotten without her. Now here's the thing, and any performer knows this. The experience was not all pleasant. We sang for about 6.5 hours the day before the performance and another four the day of the performance, not including the 2 hour concert. These are not rehearsals where you can hold back and conserve your strength and your throat. The director wants to hear what you've got he wants to fix it where it's broke. He can't do that unless you give your all, so that's what you do. Two days after the concert, I am still hoarse. At the concert itself, there's no way you will hold back anything, because if you don't give it here, what are you saving it for? We climbed five flights of concrete stairs multiple times back stage to get to our places and sat in hot, crowded rooms eating sandwiches before the show -- legs hurting, breathing hard. I understand there was an impromptu concert in the stairwell as we were lining up to enter (a worship experience in itself I am sorry to have missed) ... the choir lined up on the whole five flights. The stage was packed. With about 225 people in the choir, we were so tight that I am not exaggerating to say if you fainted you would not fall. The people you were wedged between might not have noticed. Dawn tells me there was a real danger of her chair falling off the back of the risers if she did not stand carefully. The risers were so slight that I am sure a solid 2/3 of the choir could not see the director. I couldn't and I was on the second row. This means you have to know all sixteen songs so cold you can sing them knowing that you are doing what he wants even if you can't follow. I AM NOT COMPLAINING. Quite the opposite, but these are parts of the real experience. But now, here's the biggest reality. This was not a day-off excursion for me, it was ministry. No doubt, it was more fun than people can usually say they have at work, even if they like their job, but it was still doing God's work. This concert was bathed in prayer by everyone from the top down. Almost every song rang with the gospel story, from Jesus' birth to His Resurrection, and the salvation plan is woven in the Getty's music like embroidery. The acoustics of CH give the songs of praise and adoration of Jesus a sound that must be unequalled on earth, and when Keith Getty got the 2800 people in that hall singing "O Come Let Us Adore Him" the sound was as close to being before God's throne as I have ever felt. The Gettys are unashamedly evangelical and at the end of the concert the audience was invited to reconnect with the gospel story, to consider the Christian faith, and to accept some literature to help them along the journey. I talked to two random audience members outside after the concert. 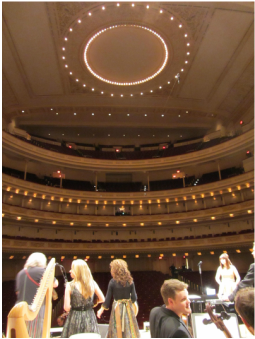 They had attended a concert at Carnegie Hall for the "bucket list" experience and were delighted and surprised that the production was "so faith based." I continue to pray for the people, like those two ladies, who went to Carnegie Hall that night for a holiday concert and got a powerful gospel presentation. I am sure many who hold season tickets and who were simply tourists taking in a show got much more than they expected. The Holy Spirit will continue to cultivate that seed. It is a shame that our society seems to lionize people who hurt others. Notice how we mythologize serial killers with special nicknames and exposes on their psychopathy, biographies, and case studies, but how seldom we remember the names of their victims. I note that while the Boston Strangler has a Wikipedea page and all his victims are listed by name, not a single one of them is linked to an article describing her life or accomplishments. His notoriety is much more likely to garner attention and emulation than the unremarked women he murdered. We glorify the mavericks and tend to think of people who try hard to play by the rules as uncreative and dull. After all, nobody ever made history by trying to be liked, right? So making enemies is a standard and expected part of being significant. From there, it's only a short step to say making enemies should be an explicit goal, a step many people delight in taking. While there is an element of truth to some of these ideas, they should not be where our primary values lie. The virtues of gentleness, kindness, patience, and peace are at the heart of avoiding being the evil person, but they are not popular symbols of strength. Wouldn't it be great if we were more likely to hear the statement, "Oh yes, Mary Brown. I've heard of her. She was that nice older Bostonian lady who was tragically killed by some madman or another." Not too long ago, I began to notice a persistent prayer in my mind. It would come when I was very tired but having trouble sleeping. I would search my mind for a way to complete the prayer, and some people and things would come to mind, so I worked my way through them, but there I lay, still awake, and the prayer still pulsing through like an infinity mirror. The prayer is "Lord, if only there was a way ..."
I think sometimes I fall asleep with the prayer still echoing in my mind. When I tried to think of why I could not complete the prayer, I was struck by a thought from Paul: "... the Spirit helps us in our weakness. We do not know what we ought to pray for, but the Spirit himself intercedes for us through wordless groans" (Romans 8:26 TNIV). The missing, dominant clause of my prayer reaches toward heaven, and the deep, inexpressible, unknowable longing of my heart is translated and expressed by the One who knows me better than I know myself. I am reminded of the longing that C.S. Lewis says we search for all our lives, a longing for a longing as it were. We are stricken with a sense that there is something that we need, but don't even know what it is, and would just like to give it a name, so we could know what to look for, but it eludes us. I see two main problems with blogs. One is that they are difficult to keep up with. One feels the necessity of constantly being interesting or engaging, to unfailingly come up with something profound to say. This is nearly impossible for anyone. Even good writers take a year to produce a book. Most of us don't have the patience for columnists who utterly fail at the task on a regular basis. So bloggers are often folks who underestimate this task. A second problem is the tendency toward self-promotion, to actually believe that I have something to say and that everyone needs to hear it. By fueling this impression I come to believe that more people need to be paying attention to me and that those who are not should be persuaded to begin. It's a pride trap if ever there was one. 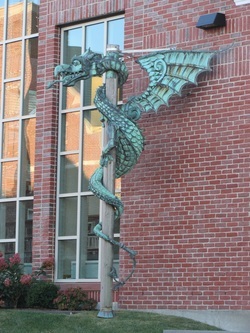 This dragon sculpture may seem an odd adornment for a Church-based school, St. George's academy in Rhode Island. But St. George, whose feast day is April 23, was more than a legend, he was a real man and a martyr for the faith around AD 303 just before the time of Constantine. Legend has it that he saved a young lady (the king's daughter) and an entire village from a dragon of truly offensive breath. After subduing the dragon with his lance, George used the young woman's garter to fashion a leash and she led the beast humbly through the town. The people were in fear, but George used the attention he had captured to preach the gospel and lead hundreds to salvation. That's the legend. The more harrowing tale begins with the pressure George felt the town was under from the pagan influence of the Emperor. The Christians cowered in fear. George, however, to break the silence, boldly stood in the town square and loudly announced his faith. After suffering numerous tortures, none of which were effective against the man's courageous stand for the faith, he was beheaded. The fear created by the Emperor, I suspect, is the real dragon he slayed. His symbol is the red cross ... the same one found at the center of Great Britain's Union Jack flag. We may not have fire-breathing lizards menacing our communities, but we do have forceful, and fearful dragons cowing us and creating silence about our faith. We will not be beheaded, but we could be berated. To save our friendships, our jobs, our reputations, and our pride, we back away from openly acknowledging our faith. May the LORD give us the boldness of St. George to stand against the tide, and claim the identities given to us by our Savior. As Mennonites we do not formally observe saints' feast days. In some ways, it is too bad. We have a poorer knowledge of our history as Christians because of our fear of over-emphasizing the saints. However, George teaches us the importance of courage as we counter-culturally live our faith in an antagonistic world.